Reign 669 – ca. 631 B.C.E. Ashurbanipal (Akkadian: Aššur-bāni-apli; 685 B.C.E. – 627 B.C.E. ), was the last great king of ancient Assyria. During his rule, Assyrian splendor was visible in its culture and art as well as its military power. Ashurbanipal created the first known systematically collected library at Nineveh. He attempted to gather all the cuneiform literature and other documents available at that time. The Library of Nineveh's rediscovery in the spring of 1850 by workmen of Sir A.H. Layard provided scholars with a vast wealth of valuable documents. Assyrian sculpture as an art form reached its zenith under his rule. The son of Esarhaddon and grandson of Sennacherib, Ashurbanipal was originally trained as a scribe. When Esarhaddon's intended heir died, Ashurbanipal was nominated to inherit the throne at Nineveh. His elder brother Shamash-shum-ukin reigned separately at Babylon. This dual monarchy worked well at first. Ashurbanipal successfully crushed revolts in the distant Assyrian vassal states of Egypt and Elam, known later as Persia. Eventually Shamash-shum-ukin revolted against his brother's increasing power, and Ashurbanipal put down his challenge with characteristic ruthlessness. The final years of his reign are largely undocumented. After his death, a power struggle resulted in the ascendancy of Babylon and the emergence of the new Babylonian Empire. The Greeks knew Ashurbanipal as Sardanapalos and the Romans as Sardanapalus. In the Bible the Assyrian called Osnapper (Ezra 4:10) is believed by biblical scholars to be Ashurbanapal. 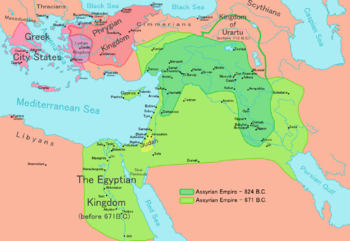 The Assyrian Empire, with areas in light green representing its extent in the time of Ashurbanipal. Ashurbanipal (also spelled Assurbanipal, etc.) was born toward the end of a 1500-year period of Assyrian ascendancy. His name in Assyrian is "Ashur-bani-apli," meaning "Ashur has made a[nother] son." His father, Esarhaddon, youngest son of Sennacherib, had become heir when the crown prince, Ashur-nadin-shumi, was deposed by rebels from his position as a vassal of Babylon. Ashurbanipal grew up in the small palace called bit reduti ("House of Succession"), built by Sennacherib in the northern quadrant of Nineveh. In 694 B.C.E., Sennacherib completed his "Palace Without Rival" at the southwest corner of the city's acropolis, obliterating most of the older structures. Esarhaddon thus emerged as king in 681 B.C.E. He proceeded to expand and rebuild the bit masharti (weapons house, or arsenal) as his palatial residence. The "House of Succession," meanwhile, was left to his mother and the younger children, including Ashurbanipal. The names of five brothers and one sister of Ashurbanipal are known. Sin-iddin-apli, the crown prince, died prior to 672. Not having been expected to become heir to the throne, Ashurbanipal had been trained as a scribe as well as the usual horsemanship, hunting, chariotry, military arts, craftsmanship, and royal decorum. In a unique autobiographical statement, Ashurbanipal specified his youthful scholarly pursuits as including divination, mathematics, and reading and writing. Ashurbanipal was the only Assyrian king who is known to have been literate. Esarhaddon reorganized the line of succession at the instigation of his mother, Zakutu, in 672, upon the death of his queen. 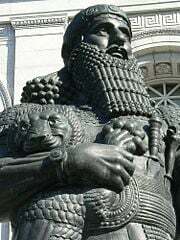 Ashurbanipal would act as king of Assyria and Shamash-shum-ukin, the older of the two, as king of Babylon, which was the capital of the first Babylonian Empire and still served as a major religious and cultural center. The situation came to an immediate crisis in 669, when Esarhaddon, during a military campaign in Egypt, died suddenly. Ashurbanipal did not accede formally to the kingship of Assyria until late in the year. To support his rights, his still influential grandmother commanded all Assyrians to support his sole claim to the throne and to report acts of potential treason against him. The official ceremonies of coronation came in the second month of the new year, and within the same year Ashurbanipal formally installed his brother as King of Babylon. The transition took place smoothly, and the dual monarchy of the youthful brothers began. Texts describe their relationship as if they were twins. It was clear, however, that Ashurbanipal, as king of Assyria, like his fathers before him, was also "king of the universe." Ashurbanipal's inheritance from Esarhaddon not only included the throne but also his war with Egypt and its Kushite lords, the kings of Dynasty 25. In 667 he sent an army against Egypt that defeated king Taharqa near Memphis. Assyria's Egyptian vassals also rebelled, and the Assyrian army had to crush them as well. The Egyptian rulers were exiled to Nineveh. The prince of Sais, Necho I, convinced Ashurbanipal of his loyalty and was sent back to become king of Egypt as Assyria's vassal. However, after the death of Taharqa in 664 B.C.E. his nephew and successor Tantamani was able to muster a force which invaded Upper Egypt and made Thebes his capital. Necho I, fighting as Assyria's vassal, may have died in the battle. Another army was sent by Ashurbanipal, and again it succeeded in defeating the Egyptians. The Assyrians plundered Thebes and took much booty home with them. Necho’s son Psammetichus I was installed as the new pharaoh and was able to gain a large degree of independence while keeping his relations with Assyria friendly. Further north, Ashurbanibal's forces successfully subdued the Phoenician city of Tyre, which had allied itself with Egypt's revolt. Syria and Cilicia also resubmitted themselves to Assyrian control, as did several other regions in the Levant and Asia Minor. For the time being, the dual monarchy of Ashurbanipal in Nineveh and Shamash-shum-ukin in Babylon continued to go according to plan. Shamash-shum-ukin's powers, however, were limited. As king, he performed the required Babylonian public rituals, but official building projects were executed under Ashurbanipal's direction. During Ashurbanipal's first years the Persian province of Elam was still in peace, as it had been under his father. Around 664, however, the situation changed, and the Elamite king Urtaku attacked Babylonia by surprise. In Nineveh, Ashurbanipal delayed in sending aid to Babylon. When he did act, the Elamites retreated before the Assyrian troops, and in the same year Urtaku died. He was succeeded by Teumman (Tempti-Khumma-In-Shushinak) who was not his legitimate heir. Many Elamite princes fled from him to Ashurbanipal's court, including Urtaku’s oldest son Humban-nikash. In 658 B.C.E./657 B.C.E. the two empires clashed again. 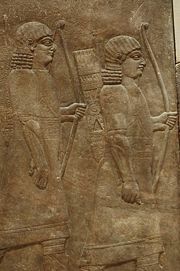 Teumman saw his authority threatened by Elamite princes at the Assyrian court and demanded their extradition. Assyrian forces invaded Elam and proved victorious at the Ulaya River. According to Assyrian records, Teumman committed suicide, and Elam became a new vassal of Assyria. 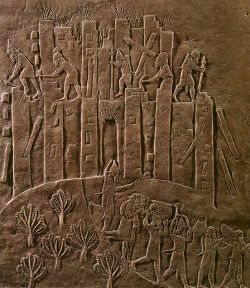 The Assyrians also punished the province of Gumbulu for its previous support of the Elamites and promptly seized its capital. The victorious army marched home, taking with them the head of Teumman. These acts are prominently depicted in the reliefs of Ashurbanipal's palace. However, Ashurbanipal's dominance in his growing empire apparently resulted in friction between the two brother kings. Shamash-shuma-ukin rebelled in 652 B.C.E., allying himself with Chaldean tribes, the city rulers of Babylonia's southern regions, the kings of Guti, and even Elam. According to a later Aramaic source, Shamash-shum-ukin claimed that Ashurbanipal was actually his subject, acting only as the governor of Nineveh. Ashurbanipal delayed an answer, due to unfavorable omens, but when he finally commanded an attack, his Assyrians proved to be more powerful. After two years, Shamash-shum-ukin met his end, in his burning palace just before the city surrendered. Once again, Babylonian records claim their foe committed suicide rather than face capture. After massacring many rebels, Ashurbanipal allowed Babylon to keep its formal independence, but it was clear who was truly in charge. The next king of Babylon, Kandalanu, left no official inscription, and his function was probably only ritual. Controlling such a far-flung empire required nearly constant action by Assyrian military forces. Nevertheless, Ashurbanipal's domain generally prospered and benefited from his capable administration. After subduing Arab revolts in the 640s, he turned again to pacifying Elam. In 639 Assyrians sacked the Elamite city of Susa, and Ashurbanipal boasted that “the whole world” was his. Ashurbanipal was proud of his scribal education. He was one of the few kings who could read cuneiform script in Akkadian and Sumerian and claimed that he even understood texts from before the great flood. He was also able to solve mathematical problems. During his reign he collected cuneiform texts from all over Mesopotamia, especially Babylonia, in the library of Nineveh, which was rediscovered in the late nineteenth century. 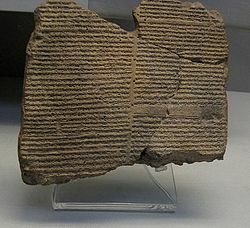 The genres found during excavations included word lists, bilingual vocabularies, lists of signs and synonyms, medical diagnoses, omen texts (the largest group), astronomic/astrological texts, and mythic literature like Enuma Elish and the Epic of Gilgamesh. Besides their intrinsic value, the documents proved extremely helpful in deciphering cuneiform. Many of the mythic literary texts would remain unknown had Ashurbanipal not preserved them in his library. Ashurbanipal also demonstrated a substantial commitment to religious building. He improved virtually all of the major religious shrines of both Assyria and Babylonia, especially Nineveh's Temple of Ishtar. He took a keen interest in omens, many of which he read himself. He also took part regularly in religious festivals. Finally, it should be mentioned that Ashurbanipal was also a major patron of the arts. He adorned his palaces with scenes depicting both his military victories and religious events of his reign. Art critics indicate that the epic quality of these bas-reliefs are unequaled. During the final decade of Ashurbanipal's rule, Assyria was seemingly peaceful, but it also faced decline due to economic exhaustion and military over-extension. Documentation from the last years of Ashurbanipal's reign is uncharacteristically scarce, given the abundance of evidence for his earlier years. Even the date of his death is not known for certain. The latest attestations of Ashurbanipal's reign are of his thirty-eighth regnal year, (631 B.C.E. ), but according to later sources he reigned for 42 years (to 627 B.C.E.). Chronological difficulties that arise from this date lead scholars to speculate that he probably died closer to 631, or that, during his old age, he may have shared power with his son and successor Ashur-etil-ilani. In any case, after his death, a power struggle ensued, involving several parties, including Ashur-etil-ilani, his brother Sinsharishkun, a general named Sin-shumu-lishir, and the eventual new king of Babylon, Nabopolassar. Babylon would soon take ascendancy over Nineveh, an empire over which Ashurbanipal had presided would give way to the new Babylonian Empire. Ashurbanipal and his charioteer during a royal lion hunt. After Ashurbanipal's death, the Assyrian Empire began to disintegrate rapidly. The Scythians, Cimmerians and Medes immediately penetrated Assyria's borders, marauding as far as Egypt, while Babylonia again became truly independent. The new Babylonian king, Nabopolassar, along with Cyaxares the Mede, finally destroyed Nineveh in 612 B.C.E., and Assyria fell. A general called Ashur-uballit II, with military support from the Egyptian Pharaoh Necho II, held out as a remnant of Assyrian power at Harran until 609 B.C.E., after which Assyria ceased to exist as an independent nation. It was against Necho II's campaign to aid Assyria against the Babylonians, that King Josiah of Judah was famously killed at the battle of Megiddo. Despite being a popular king among his subjects, Ashurbanipal was also known by enemy nations for his exceedingly cruel treatment of defeated kings. Many bold depictions boast of such cruel acts, showing that he cultivated an image that would make his enemies fear him. On the other hand, his interest in culture and writing gained him a reputation in some quarters for effeminacy, and his portrayals in art may be designed to counteract this. It was Ashurbanipal's appreciation for the value of written texts that provided his most lasting legacy. His collection of clay tablets at Nineveh proved invaluable both in the deciphering of cuneiform and as a rich source of information about Mesopotamian culture in general. Ashurbanipal's name is often used for boys within Assyrian communities today. All links retrieved April 20, 2016. This page was last modified on 20 April 2016, at 19:51.